If a online magazine wants to publish my photo, should I just say yes? Discussion in 'Digital Photography' started by mtbdudex, Aug 1, 2011. I've never been asked before. Do I "give away lots of my rights" by simply saying "yes"? There's nothing binding either way. I suppose he/she is being ethical and asking instead of just taking. The obvious is ....can I get a few $$'s for this, like $100 or so? Would help offset some recent purcahses.....fwiw this is a hobby for me, not like some of you talented people. The below was asked in my YouTube startrail clip. 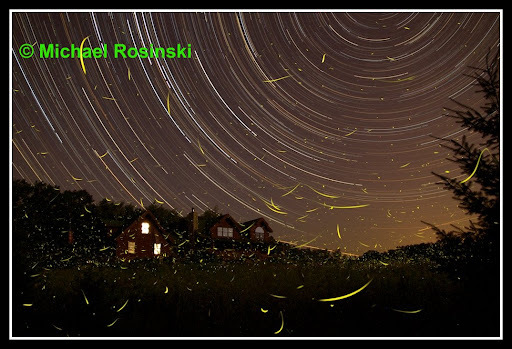 I realy like your picture of Fireflies. I'm journalist at Ciel et Espace, the biggest magazine in French.﻿ We would like to publish your picture on our web site . Is that possible ? We could put a link to your website. If it's good enough for them to publish, it's good enough for them to send a check for. Yes, you can make money from selling pix... especially if you have something a bit 'out of the ordinary'. Anyway, you're not 'selling' pix, you're 'licensing' them: ie a particular use, for a specified period of time. thx, I posted this in the YouTube comments area, curious their response. Hello and I'm curious, how'd you find this video? I posted to Canon P.O.T.N. and 2 astronomers forums I particiapte in. 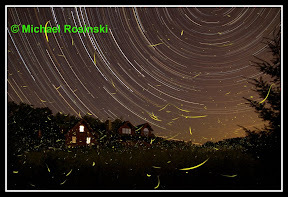 I'm confirming, you'd like to post my YouTube video and/or the resultant final jpeg startrail/firefly image in print and/or online? I have no website per say, this is first for someone to ask me. Do you pay some nominal fee to me for this? I have no website per say, this is first for someone to ask me. It is spelled "per se" and it means "by or in itself." Your sentence does not really make sense and might better read "I do not have an official web site." Do you pay some nominal fee to me for this? Why not... "Would you be able to pay me a nominal licensing fee?" I know you weren't asking for advice on grammar, so again I apologize. If you want to be taken seriously in any profession, try improving your spelling and sentence structure. And for everyone else, yes, please pick apart my post here. Remove the word "nominal" and replace it with "fair market". Get paid. They have the money, and way to many organizations prey on amateur photographers these days to save the licensing fees. I appreciate both your advice. Not an excuse, but I did this post @ work (my full time paying day job), very quickly - my bad, and they use IE7 w/o any grammar/spell check....I miss my iMac here at work. Agree, best to always present yourself in a professional manner, or don't. I'm not in the business of photography but perhaps some day I will be. But, I keep hearing photographers complain about being undercut. Selling your photo at a cheap price is bad for the professionals. Giving it away (especially to a magazine) is disrespectful to professional photographers, disrespectful to your work and damaging to the industry. Set a high price, if they dont buy it, you dont lose anything. If they buy it, you'll know what you can get for your work. This is total BS. It's not disrespectful to professional photographers and besides, they need to earn one's respect not automatically be deserving of said respect by simple default of being a "professional photographer". True professionals know the value of their work, ask for that price, and receive what's due to them. The only "professionals" who complain about this stuff are either poor photographers who are either overcharging or underperforming, or too lazy to adapt to a changing industry. Media comapanies feed off amateurs as they dont know the value of their work. There are far more amateurs taking 'lucly' shots than there are pros. Therefore, its cheaper for these companies to go the route of hustling people like the OP, as they know they dont have to pay top dollar. If every amateur says 'ah sure its only 1 picture, it cant make a massive difference', then the money dries up. Professionals (who actually have the talent) cant make a career out of their talent. I think that would be significantly damaging. I'm not suggesting that the OP is being blatantly ignorant to the pro's (in fact, he's here asking for advice on this which is good). But its worth considering the knock on effect of giving your work away for free or selling it on for cheap. Overpricing is a different matter, but media companies get no sympathy from me if they are forced to pay more. They're hounds, they'll take whatever they can get. It's not just ethics- if they just take the photo, you can sue them, France is a part of the WIPO treaty group. Only you can decide if you would rather license the image for money or not- and under what terms you're willing to do so (or not.) I doubt a link will lead to sales even if you threw up a Zenfolio site, so other than "bragging rights" a link isn't worth much at all (if anything.) For some people, that's enough, for others only a reasonable licensing fee is acceptable out of an organization that makes money. I can't decide that for you, and neither should anyone else. I doubt you'll get more than $30-45 for a Web use only license- but if you're of the opinion that you should get something, then that's the ballpark I'd suggest shooting for. In my opinion, there's BETTER bragging rights in being PAID to license an image and having it published than in just having it published, but many hobbyists are happy just to get published. Only you can decide, but your talent is worth something. The magazine has already told you that. (I assume you have checked out their web site and they are legit). I have sold several of my images and I always price them a little high. I can always negotiate down but never up. The bigger issue is rights. I have seen "agreements" in which the creator of the image pretty much gives up all rights. I would also want to know how they intend to use it beyond "publish it." Having said that, it is a nice image. I totally agree with this, the OP should definitely ask for some recompense for his photo being published. Damaging to who? The pro? To which I would ask, why does the OP care? I absolutely agree that the OP should charge, but absolutely not for the reason that he is trying to preserve the jobs/industry of other professional photographers. That is not the OP's responsibility. If the real full-time professionals can't sell the value of their expertise and experience to clients, then maybe it's time they improve their offerings or find a new line of business. You could say the same for some "pros" as well- some of them would not hesitate to take advantage of amateur photographers in order to further their own interests. For example, standing in front of or getting in the way of amateur photographers because they're "doing it for pay" while the amateurs are just "playing around". Or purposefully withhold information or advice to an amateur without them paying for "private instruction" (this is totally justified, but it falls under the same principle wherein the pro values his time/experience and does not see the need to hand out "freebies" to amateurs, and likewise the amateur owes nothing to the pro and can sell or give his/her work away freely as he/she chooses). If the OP decides to head down the road of professional photography, they might then realise the good/bad they did by setting their rate on their pics early on. This rate, and the rate set by other amateurs makes buying pics cheap. Thats bad for the industry, the current professionals and those who aspire to it. If you are in the business and look to sell your pics, you might find that the 'going rate' is significantly less than you'd expect because of the amateurs selling their one off pics. Why damage your potential earnings by undervaluing your work? Professionals (who actually have the talent) cant make a career out of their talent. I think that would be significantly damaging. I don't think being a pro implies someone has more talent than someone else, it just means that one person tries to make living off photography while the other does not. You don't need to be the next Ansel Adams to take decent photos of some real estate or for portraits for the next passport. I find nothing nefarious with amateurs getting a piece of the pie, as long as the photo is good, who cares. In my view, the OP is not even morally obliged to take the well-being of professional photographers into consideration. However, I think making sure that (s)he gets paid for letting the French magazine use his photos will benefit professional photographers as well. I never said that all pros are amazing photographers, but they do try to make a living from their work. Not sure why you said that. Like I said, if all amateurs undercut going rates for photos or even let them go for free, there would be far less money in it for anyone. Same in any industry. If you're a farmer and decide to sell your milk to supermarkets for a much smaller rate than other farmers, you damage the industry. Taxi drivers in unregulated environments suffer from poor incomes because of part time workers taking weekend shifts (where the money is) and chewing into the income of the full time drivers. Its a consideration that all amateurs should think about..... in my opinion. Perhaps it would be helpful to step away from the Us-vs-Them, Amateur-vs-Pro perspective and just consider photography as an endeavor that deserves some respect, regardless of why you do it. Do you really want to perpetuate the persistent notion that photography is easy and of little value--that all you have to do is push a little button, so what's the big deal? Where is the sense of accomplishment in producing something in that category? Why encourage that notion? Many good discussion points and advice, thank you everyone. I do respect the business side of Photography for the pros who make a living doing this. Mr. Dauvergne sent me a PM in one of the astronomer forums I posted the image at, I responded with the below. I'm open for Ciel et Espace using this image provided I am compensated via a fair market licensing fee with agreed terms. My direct email is xxxxxxxxxx, we can take this conversation and discuss further details there. As you have done this before, please propose your fair market licensing fee with agreed terms. You implied that amateurs are stealing revenues from pros. I argue it's about the photos: if the photo is great, it does not matter whether the photographer took the picture for his/her own pleasure or to make money. The OP has taken a picture and a magazine is asking him whether they can use it. I don't see how this is different from non-professionals who take pictures for the sheer pleasure of it and who exhibit their work in art galleries and such. I think you are handling the fee negotiation just fine. They probably have a standard fee - and it's not a secret. But it would be a chore to research it. Unless they absolutely need your image you're not going to get more than the standard fee in any case, so - as you did - just ask about the their standard terms and you can then accept or decline their terms. Getting your stuff published, and paid for it, is a big deal. Congratulations. If you can sell milk of the same quality to the supermarkets at a lower price than your competitors, and still make a profit, is that not an example of good business? What if a new breed of cow or new type of feed was developed that could produce 10 times as much milk as before for the same cost? Should you still charge the same rate? If I sell my car, am I obligated to raise my selling price to match that of the used car dealer, in order to make sure that his offerings remain competitive in the marketplace? Should Ford start raising the prices of their cars, in order to make sure that Rolls Royce's offerings don't seem overpriced? The fact of the matter is, progressing technology has made it such that the barrier to entry for creating photography is lower than ever, with high quality cameras available at very reasonable prices, and an incredible wealth of freely available knowledge out there for those who are willing to learn. This, however, does not mean that anyone who buys "professional" (or any) gear should start charging professional prices. The value of photography should come from the skill required to produce it, and if a pro is comeptent at his craft, he should posess considerable skill and be easily able to sell his work at a fair rate, regardless of what (or at what rates) others are selling. I want to clarify the point I'm trying to make. I agree the OP should charge, and should charge a good amount. Probably more than he initially thought. But like OreoCookie says, the value of the photograph should come from the photograph itself, and the skill of the photographer who took it, not whether or not it came from a "pro" or an "amateur". The OP has no responsibility to subsidize the incomes of working pros, nor does he have a responsibility to maintain the industry in its current state. This is the job of professional photographers, who must sell the value of themselves and their work. If you enter the professional photography business expecting to be deserved a certain rate or value for your work because you're a "pro" and "you make your living at it", you are destined to fail. Further, you are being more disrespectful of your fellow professional photographers who spent many years of hard work honing their craft to justify the prices they charge by implying that anyone who sells photographs should automatically deserve those high rates. Similarly, charging substantially less than your product or service is worth is not inherently damaging to the photography industry in particular, it's just poor business practice in general. Here is response from Mr. Dauvergne. For online posting of your image it's free - but you can have a link to your website as entice for some possible sales? If they pick for the magazine then they will pay, fee is tbd. thank you for your answer. In fact we have absolutly no commercial model for our website, so we never pay fee to publish a picture. We can just make some "advertisement" for the author and his website. If the picture is used for the magazine, it's totaly different, and it's absolutly possible to negociate a fee. In any way, Ciel et Espace, is an nonprofit association edited by the french association of astronomy. I guess I've found the video in google, when I was looking for your email adress. So, I grant them "ok" to publish my image to their site, then others can download that image and even print it for personal use but not commercial use....what am I missing here?? All content and materials available on this site - in particular, but not limited to, maps, programs and software, databases, text, photos, movies, sounds, music, presentation and logos - are protected by copyrights, rights of protection database, trademarks, service marks, patents, trade secrets or other rights and property laws. The content and materials available are either exclusively owned and controlled by the Publisher of the Site, or used under license. These conditions of use apply to all content and all material on the site. As part of a non-exclusive, non-transferable, the publisher gives appropriate to the user the right to print or download a copy, material or content from this site to external media (personal computer , mobile phone, mp3 player or mp4) for personal use and not commercial. The site can be used for lawful purposes and personal use, but not for profit or commercial. The user has no ownership rights to the content, elements and their derivatives, and the editor of Site is the sole owner of such rights. And if you get a check, just make sure Uncle Sam gets a cut. mtbdudex, I'm not sure that all sounds right to me but I'm a few other posters here in that, licensing your photo for cash would be better than some link to your blog. I would set up a license agreement with them. If you're going to school someone on the use of per se, perhaps you should think about learning to use the PM system. If teaching someone how to use per se somehow lends to the OP's question and request for advice then great, I just don't see it. Similar to what you said through your back-handed apologies, if you want people to take your seriously in life answer their question or give some fruitful advice instead of trying to fix something wrong on the internet (such as the misuse and misspelling of per se). You come off as far less professional than you think when you do that.